Common Council member Tom Livingston (D-District E), left, laughs at a joke early in Tuesday’s Council meeting; Council member John Kydes (D-District C), right, later prepares to hand over a “Council President” plaque to Livingston. “The City continues to move in a positive direction, and I know we would all like to keep that going,” Land Use and Building Management Committee Chairman Thomas Livingston (D-District E) said, after being elected Council President. Livingston takes the reins from John Kydes (D-District C), who was named the new majority leader, replacing John Igneri (D-District E). The “new” minority leader should be easy to figure out because there’s only one member of the Republican caucus, Doug Hempstead (R-District D). 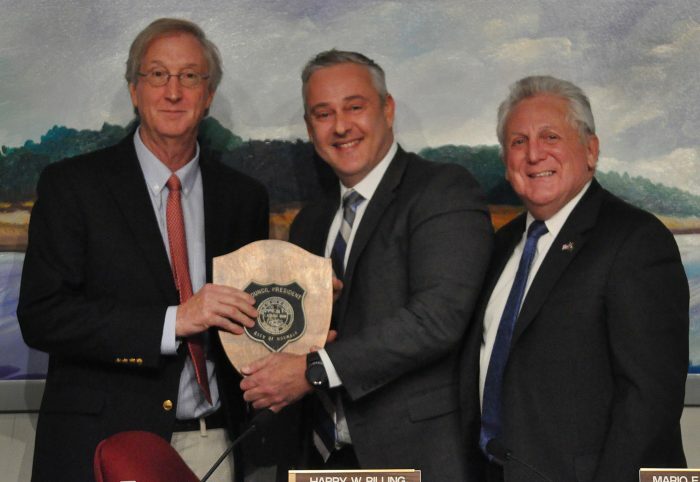 From left, Norwalk Common Council President Tom Livingston (D-District E), Majority Leader John Kydes (D-District C) and Mayor Harry Rilling, Tuesday in City Hall. Hempstead made a quip of it, as is his style. “I said I didn’t want to do it again but I lost the argument,” Hempstead said, of what must have been a heated discussion in the caucus room that only he was in. Igneri nominated Livingston, and commented that although they both live in Rowayton, he wasn’t friends with Livingston before they were running mates in 2013. Hempstead said Kydes has done a wonderful job as Council president and noted that he’s had respectful disagreements with Livingston. Livingston said he’s learned much from Kydes and Igneri. He also wants to continue promoting a “healthier, more sustainable city,” and enact a plastic bag ban in addition to the bike share agreement recently approved, he said. Livingston noted that it’s going to be a challenging budget year with the “big ask” coming from the Board of Education and the revaluation of properties. Council members are hearing from seniors and others who wonder if they can continue to afford to live in Norwalk, and the Council will work to balance those needs as it has in the past, and re-address senior tax relief, he said. Assistant Corporation Counsel Diane Beltz-Jacobson has moved on, Corporation Counsel Mario Coppola said. He explained that Associate Corporation Counsel Darin Callahan is moving up and Attorney Christie Jean has been hired as Associate Corporation Counsel. 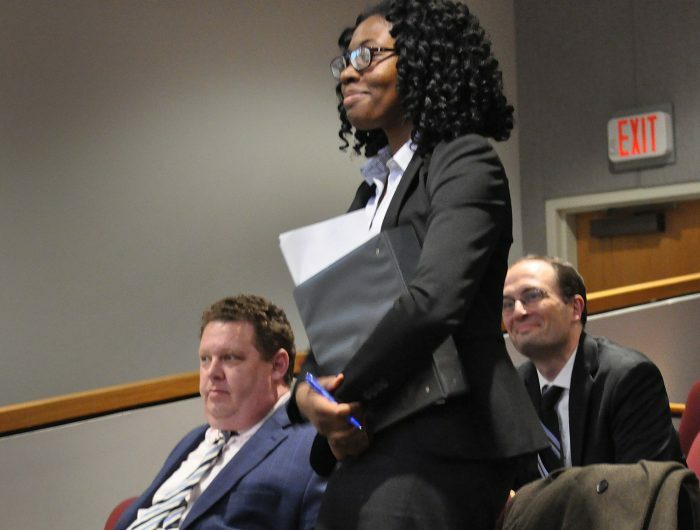 Associate Corporation Counsel Christie Jean stands for recognition Tuesday in City Hall, as Assistant Corporation Counsel Darin Callahan, left, and Assistant Corporation Counsel Brian Candela, right, watch. The Council unanimously approved Jean’s appointment and Callahan’s promotion to Assistant Corporation Counsel. Jean is a 2007 Stamford High School graduate who graduated with honors from the University of Connecticut School of Law in 2014, according to her resume. She has been an associate at Robinson and Cole LLP for four years, one of more than 200 attorneys in a $100 million practice. According to her resume she has represented state and municipal governments in bond issuances and other debt obligations, and analyzed federal, state and New Haven laws in addition to legislative and regulatory proposals. Coppola said she was top of her class at UConn and has great references and recommendations. He noted that Callahan stepped up when Beltz-Jacobsen left, and previously helped on “so many issues” and “significant matters” when he began work in Norwalk in May. Beltz-Jacobson took early retirement in mid-October, according to minutes from a September Municipal Employees Pension Board meeting. The Council unanimously approved the proposed settlement to Norwalk’s lawsuit against the Hanover Insurance Group, which stems from an October 2016 wire transfer of $894,464.83 to scammers. Terms of the settlement were not disclosed. The lawsuit followed Hanover’s refusal to cover Norwalk’s loss, a payment which would at most be $490,000 as the policy has a $500,000 limit and a $10,000 deductible. Rilling on Monday promised a press release on the matter, possibly as early as Tuesday, but Coppola said Tuesday that a statement won’t be released until the legal settlement is finalized. The settlement is “fair,” Hempstead said to NancyOnNorwalk. “I think for us to get anything out of this was a good thing,” he said. Farmington fell for the same scam, to the tune of more than $2 million. Norwalk could have wired more than it did, had the fraud not been discovered before a second payment of $894,464.83 went through. There are 169 municipalities in Connecticut and only Norwalk and Farmington got scammed-sorry @Hempstead, ‘stuff happens’ is a cop out. This was the mistake of a department that obviously didn’t have protocols in place and had a total lack of sophistication. Norwalk pays its staff way too well for this kind of sloppiness and lack of accountability. When is Rilling going to give the entire POKO explanatory statement that he promised? It is 2 weeks over due. But, on the topic of the boneheaded, easily preventable move of sending $1,000,000 to Chinese scammers who used the highly sophisticated hacking technology of sending an email that said, “Send the money here, instead,” nobody has anything to say. This council is absolutely spineless. All of them. Bar none. Really? NOBODY has the guts to come out and say, “This really makes us look like clowns. There’s no excuse for it and it seems an awful lot as if we’ve all just been going along to get along and I promise to try to do better going forward. And Doug Hempstead’s comment is, “Stuff happens?” Are you serious? It’s no big deal? How much tax payer money do we need to send to people before it’s a big deal, Doug? $5,000,000? $10,000,000? Don’t disrespect the time Norwalkers spend away from their families to pay their taxes, Doug. To tell me that’s just, “Stuff happens” is beyond infuriating. Especially, as we stare down the barrel of the next inevitable tax increase. Is this truly the attitude? It doesn’t matter because we can just get more money from the Norwalk tax payers? 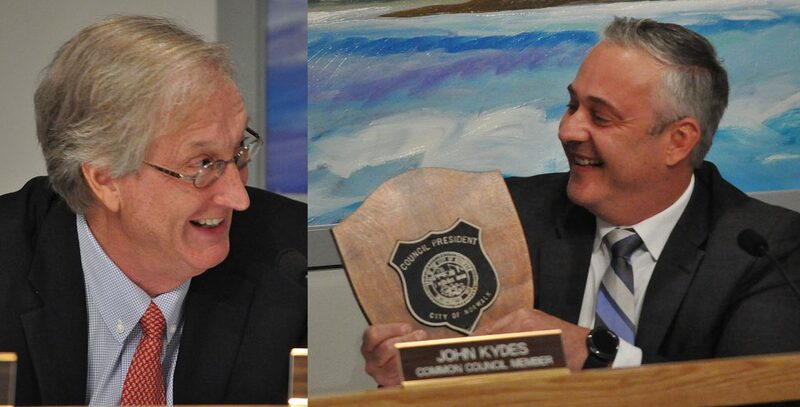 pictures shows it all , they both are laughing at Rowaytonites and the city they just pulled off another Rilling. Odd how Grasso did the driveway yet the sidewalk is not passable to the handicap, it was said the DPW condemned the sidewalk yet this summer all the streets got new sidewalks yet no infrastructure got done. Livingston i presume? This is the picture all over the city half donkey butts jobs and when the voters look into the mirror they see those butts. Why a tax increase the mall was going to save Norwalk. Let the city now show the spreadsheet millions will be needed to sustain the mall and no full taxes for years if I read the fine print. Mr Livingston there is a lot you should be proud of owning Firetree is one of them. Council leaders come and go. But City taxes always rise as Council leaders refuse to demand using Prof. Search to hire Top Talent and pay Administrators bonuses based on producing better services for lower outlays. Council leaders show no interest in demanding professional management at City Hall. Nothing will change until City voters elect officials with significant business experience. Otherwise Norwalk remains the “hole in the middle of the donut”. Sadly. When “Stuff Happens” there is usually a call to action to prevent that type of “stuff” from happening again. Either the question wasn’t asked or it wasn’t offered, i am believe the latter. Let’s not make the Doug the scapegoat for a faulty IT Infrastructure because of a gotcha quote. Hopefully in the realignment, there will be people that oversee that something like can’t happen again. A quick google search on ransomware can show you just how bad this could have been, ask the City of Atlanta. This happened to the company I work for about 2 years ago. Someone will receive an email that appears to be legitimate to request a change in banking information. We were fortunate in that our bank was able to retrieve the funds back but the authorities were involved. We have since instituted a policy now that all bank changes must be verified by both a phone call and an email to a trusted contact at the company. This scam has been going on for quite a while now and it is very common. I would hope that proper procedures are now in place to avoid this from happening again. I’ll vote against every incumbent. Losers one and all. High school sophomores would do a better job. That’s what worries me. I haven’t seen the city give us assurance that they have put new procedures in place. For security reasons they may not want to disclose the details of those procedures, but once the settlement is finalized I really hope they will make a public statement that they have instituted new, tighter procedures to prevent this sort of thing. @elsa, don’t hold your breath. Rilling is not affected by this and is probably laughing right now. All of us on the Council and in the City were in fact very disturbed by the loss. We appreciate that it is taxpayer money and took it very seriously. That is why the City pursued all legal remedies, including the claims approved last night. Unfortunately, this type of crime is a reality in today’s world, and as Mr. Hempstead noted, we were not the only municipality hit by this scam. What we need to do, and what we have done, is review what happened and make sure that steps are taken to ensure that it doesn’t happen again. Thankyou for your comment and good luck in your term as Council President. Finance Committee: Communicate which steps have or will been taken since the incident in at least general terms. Personnel: Discuss and communicate to public what steps will be taken about training appropriate staff to avoid a repeat of this matter. Also, what steps are taken if staff bypass proper procedures? But we haven’t heard or seen any protocol put in place. Just because you say it’s done doesn’t make it so. Just because it happens to other towns doesn’t make it right or provide any relief. So now you are saying it’s okay that Norwalk employees are just as dumb and gullable as another town that is the laughing stock of the state or country? You guys are only putting in safety measures after the fact. Sad and embarrassing. Thank you Mr. Livingston. Knowing that some people do not read comments, I have added your sentiments to the story. But wait, this is government and not the real world… of course that employee didn’t get fired. Probably promoted to lead the task force on what not to do. My tax dollars can’t support any more incompetence in city hall. Sorry Mr. Livingston, I don’t feel any better that one other municipality got duped. Plus its been TWO years and you’re NOW just saying now are putting together protocol???!!! Seriously?! Two years after the fact. That’s norwalk, ready on the forefront! Lol… pathetic it took so long but yet you can immediately ok a million dollar new infrastructure so rilling has even less to do (as if that is possible) but yet procedures to prevent monetary losses…oh, wait two years. If members of the Common Council find themselves frustrated by my tone, it’s because in this and other instances you people are reactive rather than proactive. Operating that way is stumbling inefficiently from one preventable failure to the next rather than plotting a course of successes. This episode is exactly illustrative of that. That said, I frankly don’t care what happens in Farmington. Farmington didn’t carelessly send my money to China. Norwalk did. This nonsense where we pretend that we can’t possibly deal with things or know “what’s going wrong and what’s going right” until AFTER it happens is totally ridiculous and it needs to stop. TODAY. This “scheme” wasn’t even as sophisticated as Ferris Bueller’s door bell setup. This wasn’t unknowable. It could have been prevented by requiring a wet signature, a physical voided check or letter from the bank accepting funds and making a confirming phone call. It’s not, “well now, we know.” It’s, “how could this have possibly happened at ALL?” Professional organizations that send and receive money and have an internet connection have had protocols in place for decades. How is it possible and acceptable that we couldn’t be bothered with it until someone managed to fat-finger $1,000,000 to Chinese teenagers? Let’s not forget we pay top dollar to a national audit firm who should be held to account. They wouldn’t be responsible for the lapse in internal control or monetary consideration, but they should be helping us to identify these shortfalls and opportunities, and in this eggrigious case…immediately. DougH’s comments come off nonchalant. Trust me, Doug is as sick about this as anyone, but “stuff happens”. Let’s fix the controls and move forward. Congrats to TL for his appointment and kudos for JK’s service to our city. Whether or not the auditors caught this, the city knew it happened. It was kept from the voting public prior to a municipal election, with comforting whispers that the insurance would cover it. Guess what. The insurance didn’t cover it. So we got scammed. Paid premiums for insurance that didn’t cover us. Paid lawyers to sue so we could recover a “fair” amount. This City needs to focus on delivering on its corecompetencies. Its frightening that we are chasing the goal of becoming Stamford when we can’t even manage bulky waste pickup and yard waste piickup in the same calendar month, much less manage wire transfer payments in the hundreds of thousands of dollars. Show you all how pathetic it is to have anyone solicit support for the city by telling us they have compassion. The city was duped the taxpayers were hosed mislead and lied to . All in a days work for city hall, it’s more like tradition and a sport. It seems ironic that Norwalk voters who wanted to send a message to the White House, can’t seem to be able to send one to their own City Hall. QUESTION: Who is running The City of Norwalk? Knowing what happened and keeping it quiet for two year!!!!!!!!!!!!!! Unacceptable, the Mayor needs to be accountable, he should have come forward 725+- days ago. What else is kept quiet. The citizens of Norwalk deserve better than this. Disgusting!!! He should be ashamed of himself for such despicable behavior and negligent of his duties to the citizens of Norwalk. It’s not the job of the auditor to approve and submit payments to the city’s vendors. How anyone in charge of taxpayer money could be ignorant of email phishing and other scams in this day and age is astonishing. Especially when no one bothers to follow up on the alleged “services rendered” that cost us a whooping $900,000. As someone mentioned, people should remember this the next time one million dollars has to be cut from the education or other essential budget. Tom Livingston you join Earnie at Washington village and Ivers says he has it all under control, yet kids are still are in the buildings that are slated for demo. Do we send officers in buildings with asbestos or do they sit outside and wait till morning? Tom your laughing at us whats the deal with Washington Village?